Heckuva a thing. MagNet organizers will want to make a quick change to the promotional copy for June's conference to take account of the fact that its kickoff speaker is switching jobs. "Havens has been credited, along with his former boss [Justin] Smith, with The Atlantic's aggressive focus on digital strategies, which led to his promotion to president in 2012," [says a story in Adweek]. "The Time Inc. gig gives him a much bigger platform, but one that's been considered slower-moving on the digital front. "They wouldn't be hiring me if they didn't want to make some radical changes to their digital platform," he said. "They're willing to break some eggs to get it done." "Scott’s role is a big one. Digital is a critical growth area moving forward, and we have ambitions to significantly grow our scale. Scott’s job will be to drive this aggressive expansion." “DPS and Adobe Experience Manager make it significantly easier for publishers and brands to produce consistent, rich content for customers on mobile and the Web,” Nick Bogaty, head of digital publishing, Adobe said in the company’s announcement. "We don't preach to the choir. We preach to the uninitiated." -- from an interesting profile in the Halifax Herald about the publisher of Mindful and Shambala Sun, Jim Gimian. John DeMont reports that a year after launch Mindful has 40,000 subscribers, almost all of them in the U.S. and it puts 35,000 more on the newsstands; this doesn't include readers who find it online at mindful.org. Sister publication Shambala Sun, with its Buddhist content is thought to be one of the best-selling magazines in the U.S., where it has 70,000 subscribers. So Gimian and his colleagues must be doing something right with their "mission-oriented journalism". For the first time, the Newsstand Marketer of the Year was declared a tie, with Bernie Menchise of TC Media and Craig Sweetman of CRS Media Consulting sharing the honour. The awards were co-produced by Magazines Canada and the Circulation Management Association of Canada. The awards reception was sponsored by the Alliance for Audited Media and other sponsors were media sponsor Masthead; marketing sponsor Covers Sell; design sponsor K9 Design Co.; promotional retail sponsor Gateway Newsstands. Brandie Weikle, the editor-in-chief of Canadian Family says that it was time for the magazine to deliver a dedicated iPad tablet version to its readers. The iPad edition is fully redesigned to display properly on the iPad, including interactive functionality. The edition is $3.99. An Android version is in the works. Most readers will get their first chance to see the magazine this way with the popular March Baby issue. The Hockey News already has out a digital commemorative Olympics edition with a beaming cover pic of the team after Sunday's Team Canada men's gold medal hockey win. Available for iPad. Kingston Life has a spread of haunting photos taken inside the recently decommissioned Kingston Penitentiary by photographer Tim Forbes. The assignment was is an auspicious start for new editor Danielle VandenBrink. The limestone pile has been around 180 years and has housed some of the most infamous prisoners in Canada, including Clifford Olson, Paul Bernardo and, more recently, Mohammad and Hamed Shafia. The e-edition of the magazine is available online. The Canadian Cover Awards/Grands prix canadiens-Meilleures couvetures are to be presented Tuesday at the Courtyard Toronto at 6 p.m. Along with the various category winners, this year's Newsstand Marketer of the Year will be named, an individual who demonstrates true innovation in a successful newsstand marketing project. The awards are a joint production of Magazines Canada and the Circulation Management Association of Canada. Sponsors are reception sponsor Alliance for Audited Media, promotional retail sponsor Gateway Newsstands, marketing sponsor Covers Sell and design sponsor K9 Design Co. The Alberta Magazine Publishers Association is offering a webinar on data journalism on Monday March 3 from 12 - 1 p.m Mountain Time. with Glen McGregor, a national affairs reporter for the Ottawa Citizen. He'll be talking about how investigative reporters who once used print documents are increasingly turning to electronic data to research stories and will discuss how new stories can emerge from thousands of lines of texts and numbers, and introduce the tools and techniques of data journalism that today's journalists can use to accelerate their stories. McGregor is a leading advocate for data journalism in Canada, and has taught data skills to journalism students at Algonquin College. He regularly leads hands-on data sessions for the Canadian Association of Journalists. The webinar fee is $25 for AMPA members and students, $45 regular rate. Register by 10 a.m. March 3 The AMPA rate is also offered to members of provincial magazine associations: Magazines Association of BC (MABC), Manitoba Magazine Publishers Association (MMPA), Atlantic Magazines Association (AMA) and L'Association québecoise des éditeurs de magazines (AQEM). The Western Magazine Awards Foundation has appointed Kate Cockerill as its new executive director. Cockerill is the owner of Kate + Sebastian, a Vancouver-based communications and design firm, and brings both association and event management experience to the job. She replaces interim executive director Sylvia Skene and Corey Van't Haaff, the former executive director. "After an extensive executive search, the board of directors is very pleased that Kate has agreed to join our organization. We look forward to building on the strengths of the foundation with Kate at the helm,” said Jane Nahirny, WMAF president. Cockerill has held senior positions with the Association of Consulting Engineering Companies - BC (ACEC-BC), from 1998 to 2005, the International Institute of Communications (IIC), from 1993 to 1997 and has served on a number of boards including: Architectural Foundation of BC; Society for the Museum of Original Costume; International Children's Film Festival; and the Vancouver Opera Guild. The 32nd annual Western Magazine Awards are being presented this year at a gala reception on Friday, June 20. Finalists will be announced in May. TC Media is closing down the print version of Fresh Juice, effective with its current February/March issue. The magazine was launched in April 2012, in partnership with Loblaw, Canada's largest grocery retailer; TC Media was responsible for all content and Loblaw for most of the distribution. Some 400,000 copies were printed of each of its 6 issue, with 325,000 sent to the chain's most loyal and highest-spending customers and 60,000 to TC Media subscribers and 15,000 net sold on newsstands. Fresh Juice will continue to be provided online, including its e-letters and social media, according to an official statement from TC Media. As the brand evolved, it became apparent that this niche market of engaged consumers gravitates towards digital content, therefore it has been decided that Fresh Juice, the print magazine, will cease publication and the current February/March issue will be the last. Most senior staff have been laid off and some junior staff have been moved over to Totem Brand Stories, TC Media's contract-publishing arm. Fresh Juice was never officially positioned as a replacement for Homemaker's magazine, the subscription-based title which TC Media shut down in fall 2011 after 45 years. But that was how it was widely perceived. "If The Grid were a friend — and it seems like it’s aiming to be – it would be the one who grabs this and that from their closet, adds a colorful scarf and a thrift shop bracelet to create a near perfect effect. "Pleasingly jumbled at first glance, the whole look is deceivingly harmonious and smart, supported by a design grid that might be 7 columns, 5 columns or somewhere in between, but is always in the neighborhood of hip." Penny Hicks, who had been publisher of Maclean's since December 2011, has been named group publisher for the women's service magazines at Rogers Publishing, responsible for Chatelaine, Today's Parent and Canadian Health & Lifestyle. She replaces Tara Tucker whose position as publisher of Chatelaine has been eliminated after two years in the position. She is leaving the company. The announcement by Steve Maich, senior vice-president and general manager, publishing, is part of a major shakeup at Rogers. Hicks's appointment as group publisher parallels the appointment of Melissa Ahlstrand to be group publisher in charge of Flare, Hello! Canada and the trade magazine Cosmetics. Maich says that there will be further group publisher appointments, one in charge of current affairs (Maclean's and Sportsnet) and one in charge of Quebec-based titles (Chatelaine and LouLou (French and English)). "Moving forward, we will operate under a Group Publisher model, with our publishers each overseeing a content category made up of more than one brand," he said in an internal company memo. "This new structure allows us to take advantage of editorial and advertising synergies in each group, and adapt to the rapidly evolving media environment. The change is driven by our desire to not only remain competitive, but build our brands on all platforms and grow our business." the appointment of Rosemary Munroe as senior director of partnerships and new business for all magazine brands and brand extensions, such as the Today's Parent Approved program. Jim Hicks steps back from being publisher of Cosmetics to make way for Ahlstrand and to prepare for his retirement. Carole Beaulieu will continue as publisher and editor of L'actualite. Melissa Ahlstrand was recently named group publisher for the fashion and beauty portfolio at Rogers Media, responsible for Flare (where she has been publisher since mid-2012), Hello! Canada and Cosmetics, the trade magazine. Ahlstrand had previously been LouLou national sales director and an account manager at St. Joseph Media's Fashion Magazine. Toronto Life magazine has launched a new iPad edition, coincident with its March "Best Doctors" issue that is available today on newsstands.The free custom app makes the tablet version of the magazine available (by subscription), along with video, interactive features and slideshows. The app is free at the iTunes store.Toronto Life print subscribers are being offered a 30-day free trial subscription of the tablet version. Interesting nugget from Marketing magazine, gleaned from the recently released Alliance for Audited Media data is that approximately 72% of Canadian consumer magazines -- 50 of them -- reported producing digital replica editions in December 2013. The 125,000 circulation may account for only 1.6% of total paid, verified and analyzed nonpaid, but it is nearly triple what was reported for the same period ending December 2012. The Canadian Society of Magazine Edtiors (CSME) has launched its search for the best work of 2013 for its Editor's' Choice Awards. Submissions are due by Friday, March 14 at 4:30 p.m. and is open (and free) to all CSME members. The winners will be announced at a gala event during the MagNet conference in June. Entries are welcomed for magazine of the year in each of three circulation categories (under 50,000, 50,000 to 149,999 and 150,000+) as well as trade magazines. There are also awards for best front of book, the Jim Cormier Award for display writing, best website and Editor of the Year. This year CSME is introducing a Tablet Award as well as one for best art integration. Canadian magazine circulation declined 5.7% for the six months ended December 31, according to Alliance for Audited Media data. Paid subs were down 5.4%; single copy sales down 12.7%. Of 61 reporting titles, the leading publications were Chatelaine (523,942, down 2.3 from the previous year, same period), Canadian Living (520,239, up 1.4%), Reader's Digest (396,692, down 16.1%), Maclean's (295,888, down 5.2%) and Style at Home (237,862, up 2.1%). Digital circulation for 50 titles reporting it showed a tripling to about 125,00 circulation or 1.6% of total, paid, verified and analyzed non-paid circulation. Leaders in digital circ were Reader's Digest (34,117), Canadian House & Home (11,045), Maclan's (7,807), Selection Reader's Digest (6,035) and Chatelaine (5,590). The total circulation of U.S. consumer magazines decreased 1.7% in the second half of 2013 compared with the same period 2012. According to a report from the AAM, the decline was mostly in single-copy sales, which fell 11% from 25.4 million to 22.6 million. Paid subscriptions fell from 264.9 million to 262.8 million. Digital circulation growth pulled the numbers back up by increasing 37% to 10.6 million copies; still, a relatively small (3.4%) of total circulation. The merger of Canada's major accounting organizations required a couple of things, including a new name, and as a result, a rebranding and creation of a new, merged magazine out of two excellent predecessors. The result was officially launched yesterday, with the first issue of CPA magazine. It serves a core audience of Canada's accounting profession, has a circulation of 180,000, comes out 10 times a year and is looking to serve a much broader readership. In addition to the kind of content and features that appeared in CA magazine and CMA Magazine, there will be more opinion pieces and articles about management, finance, technology and lifestyle. "We will address topics and issues that are important to professional accountants along with Canada's top business leaders and decision makers," says Cairine Wilson, the magazine's publisher [in a release] "CPA Magazine is ambitious. We aim to inform and spark discussion by being a trusted resource." "CPA Magazine educates, engages and entertains. Its content and delivery systems ensure strong penetration in the marketplace. If we are to connect Canadians from coast to coast, we must deliver the magazine in a format that meets their needs." 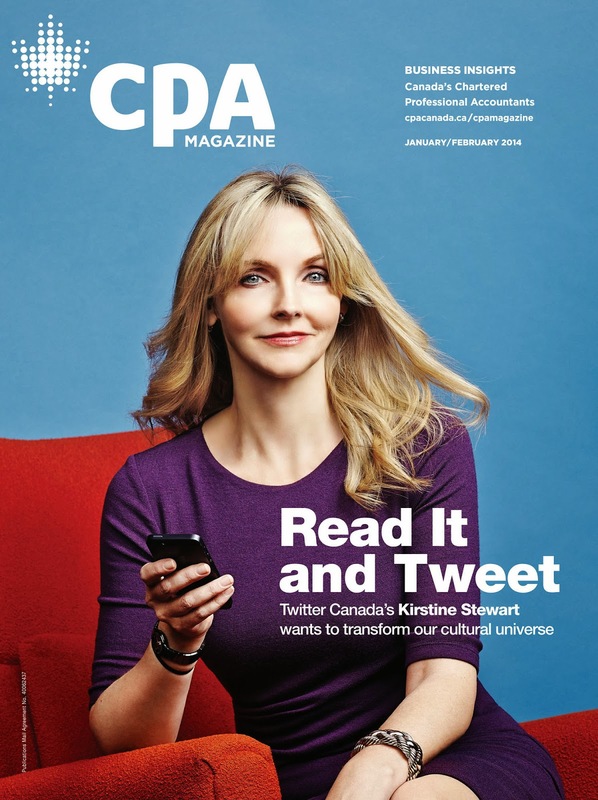 The inaugural issue features an exclusive interview with Kirstine Stewart, managing director of Twitter Canada and stories on cyber warfare, Bombardier's new CSeries jet and the first-ever CPA Canada compensation survey. The magazine is available on newsstands, by subscription and in a web edition. Time Inc., preparing to spin off its magazine division by this summer, is reported to be cutting about 500 jobs out of its complement of 7,800. A memo to staff Tuesday from CEO Joe Ripp said that three publishing groups set up only 6 years ago -- News and Sports, Style and Entertainment and Lifestyle -- are being consolidated into one, to be co-managed by two executives, Evelyn Webster and Todd Larsen. The layoffs, reported by the New York Post, are largely the result of integrating the various titles acquired from American Express Publishing, including Travel + Leisure and Food & Wine. It has already been reported that Executive Travel was being closed. Among the casualties of the shakeup was a 21-year veteran of the company, David Geithner, who oversaw People, InStyle and Entertainment Weekly (he is the brother of the former U.S. Treasury Secretary Tim Geithner) and Ed Kelly, who was CEO of American Express Publishing. Jane Francisco has wasted no time in making her mark at Hearst's Good Housekeeping. According to a story in AdAge, the former editor-in-chief of Rogers flagship Chatelaine has already redesigned the look of the March issue of the magazine, the first with her name on the masthead. Her challenge is somehow to revitalize the 129-year-old magazine without cheesing off its 4.4 million existing subscribers and attracting newer, younger women readers who might not be expected to read a magazine with the word "Housekeeping" as part of its logo. "I wanted someone who had an unexpected take, not someone who had potentially edited three of these magazines in the U.S. in the past," said David Carey, Hearst Magazines' president. "Jane has great instincts for transforming a legacy business and making it more modern." "Her mandate is not to turn the business upside down," he added. "But at the same time the role of all the women's lifestyle magazines that have a service component have to be constantly reexamined." One example of hitting the ground running is that, in May, Good Housekeeping will roll out its first All Star Beauty Awards, a biannual compilation of the best beauty products carrying the seal of the Good Housekeeping Research Institute. "We target women who have a busy life," [said Franciso.] "We can deliver the one-stop shop if you can't make it through your shelter magazine or if you're interested in fashion trends you can use today." Most people in the U.S. rely on browsing through an app store (Apple or Google Play)or the recommendations of friends and family to find new mobile apps, according to data reported by eMarketer. Only 5% find out about them through magazines and newspapers and only 8% through sites accessed on desktop and laptop computers. The same report quoted a Juniper Research forecast that the number of app downloads would double in the next four years, rising to 160 billion. The Alberta Magazine Publishers Association strives to provide some robust and affordable content in their occasional seminars and this week is a good example, with seminars in Calgary (Feb 6) and Edmonton (Feb 7) where Wayne MacPhail is presenting "Thinking Outside the Back Cover: How to Develop and Execute a Rich Media Strategy". MacPhail is the president of w8nc Inc. and comes from both a print and an online background. Among other things he is the director of emerging media for rabble.ca. The sessions are 90 minutes and cost $25 for AMPA members. Registration closes Thursday morning.